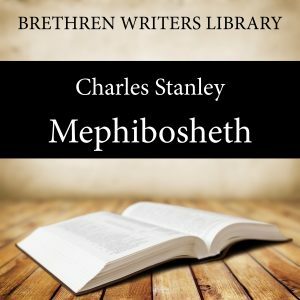 Mephibosheth, or, The Kindness of God. In this beautiful exposition of the unmerited kindness of King David toward the poor lame orphan Mephibosheth, we see a picture of the kindness of God, through Jesus Christ. The condition of fallen man, the wondrous grace of God in His kindness to poor lost sinners and the privileges of conferred sonship - “and thou shalt eat bread at my table continually” - are clearly brought out by this gifted expositor. Charles Stanley (1821-1890), of Rotherham, England, was left an orphan at the age of four. Converted when fourteen, that year he preached his first message. At age twenty-three, with meager capital, he had begun his own hardware business in Sheffield. Then the businessman met Captain Wellesly, (the nephew of "the Iron Duke" of Wellington). Under his gracious teaching, the Bible became a new book to him. It was his daily study, and "he grew in grace and in the knowledge of our Lord and Saviour Jesus Christ." His favorite Old Testament story was of Mephibosheth, the orphan who was tragically crippled. Speaking of his message on Mephibosheth, he remarked: "I believe the Lord rarely ever led me to preach from Mephibosheth without souls being converted”. We pray that the rich mine of spiritual truths in their writings may be opened up to you that you may be built up in your most holy faith. Many of their writings are freely available online at Stem publishing.com. This edition is published with the prayerful desire that the Lord Jesus Christ will use this God-given ministry in this form for His glory and the blessing of many in these last days before His coming.